This is a sponsored post on behalf of Gifts for you now. However, my love of these products is all mine. Valentine’s Day is approaching, and it can be hard to get the special someone in your life a gift that encompasses your love for them. Although,everyday should be Valentine’s day we’ve all come to expect a little something extra on February 14th. So why not make it a gift that commemorates special times, and places for you both, jokes or just plain says I love you in a simple way. 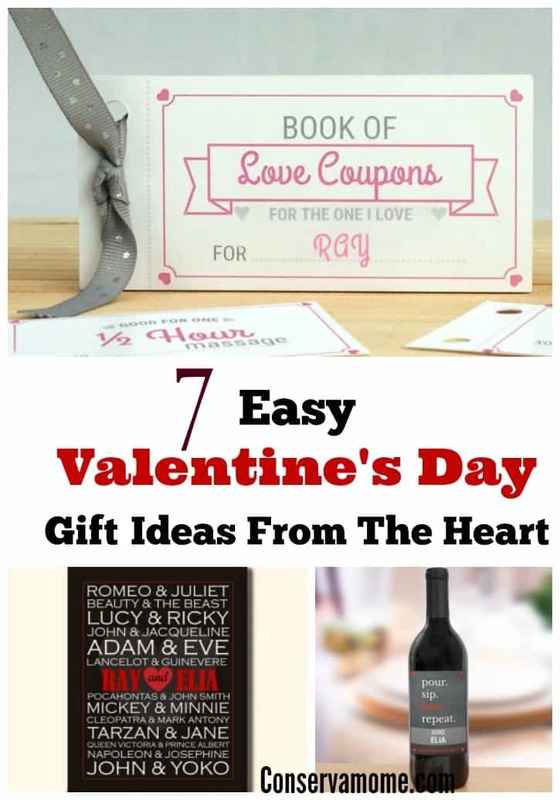 So check out these 7 Easy Valentine’s Day Gift Ideas from The Heart that can all be found inexpensively at Gifts For You Now. Best of all they ship in 1-2 days and many of these fantastic Valentine’s Day gifts are priced under $25! So check out this list of products that are easy to order for your loved on and will be the perfect Valentine’s Day gift from the heart. Personalized “Where it all began” throw pillow. My husband and I have lived in 3 states since we married, but it all began in Florida. Show your love how you still remember where it all began with this adorable throw pillow that will be a center of the fun for years to come. 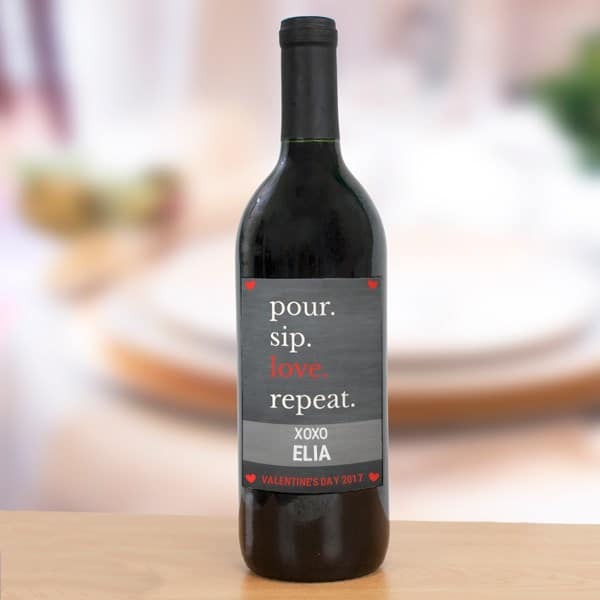 Everyday can be a special holiday when you bring out the good bottle of wine. That being the one that shows how much you love each other. 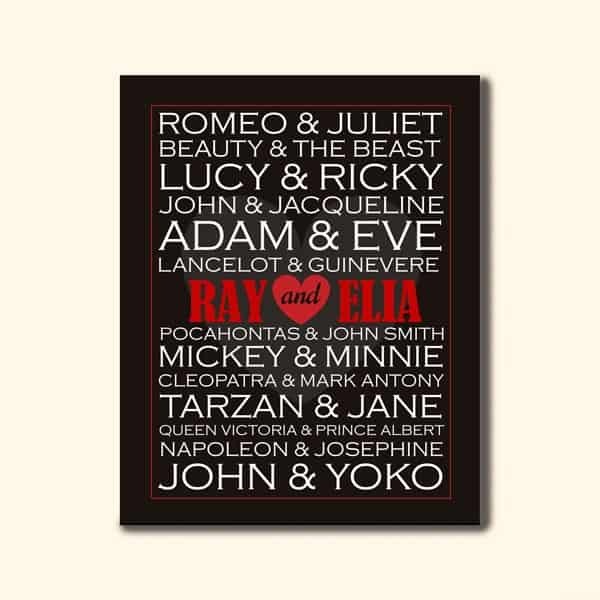 This personalized famous couples wall canvas will go down as one of the most romantic pieces of art in the history of love. This clever canvas is covered with names of the greatest lovers in history, including your which will will be listed smack dab in the middle. 4. Where it All Began Cutting board. Another great “where it all began piece”. 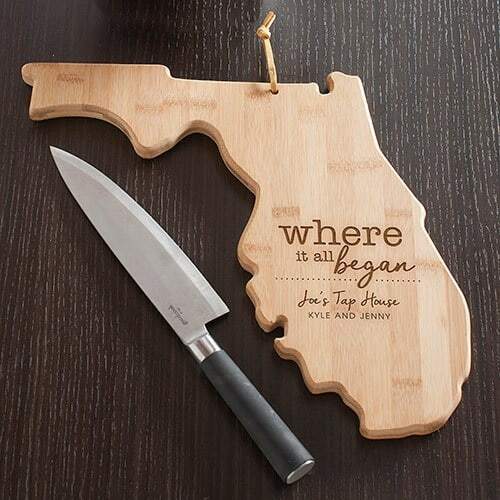 This gorgeous cutting board can be found in various states to help commemorate where it all began. You can use it as a cutting board or hang it up as a fun decoration piece. Either way this is a fun way to show everyone where it all began. This is always a favorite one because it’s so much fun! You can add anything you want to it including sleeping in, dishes and more. I would be cashing these babies in with the hubby for sure! Who couldn’t sue a 1/2 hour massage or Sleeping in late? This one has been my favorite of all. I put it right on my wall under my family pictures. 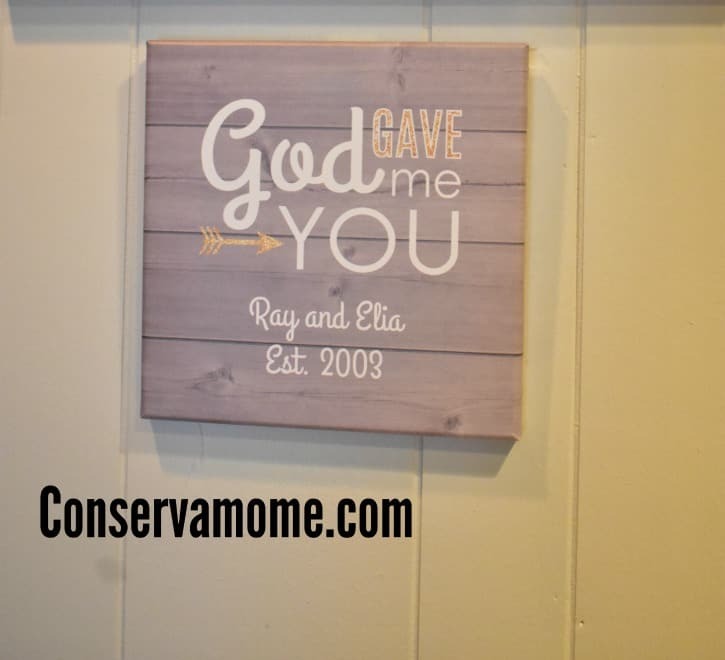 Honor your never ending love that comes from above with this personalized canvas. It’s the perfect size and way to say I love you! 7. 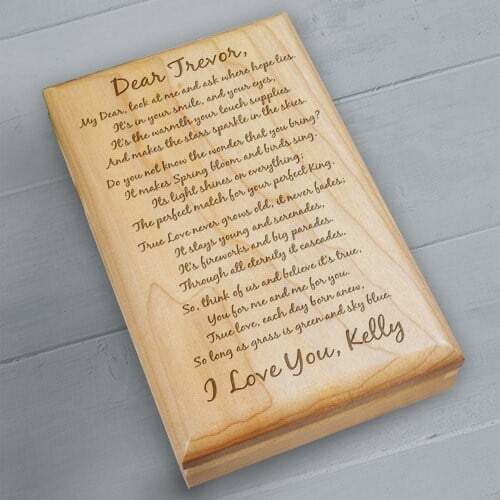 To My Love… Personalized Valet box. You don’t have to be a poet to say beautiful things. Thanks to the amazing folks at Gifts For you now you can say what needs to be said and personalize it easily with this beautiful with this box. Each engraved keepsake box holds your most treasured mementos safely while looking great on your dresser top. This makes a lovely gift for her on Valentine’s Day or Sweetest Day. This Valet Box is handmade of natural cherry wood with inside felt lined compartments and hidden solid brass hinges. It Includes FREE Personalization! You can choose from 2 poems or write your own . These are all great gifts you can get at Gifts for you now. Easily and shipped to you quickly. Best of all you can see exactly how your product will look before you order. With amazing low prices, fast shipping and excellent quality your Valentine’s Day will be easy and fun thanks to these great choices. To check these choices out along with other great ones, head over here. Hey your husband and my husband have the same name. I’m going to bake him a heart shaped cake. I think these are all lovely and thoughtful ideas. My favorite is the personalized valet box. It’s so hard finding good gifts for v day, but after reading this I definitely have a few ideas in mind! I love the famous people wall art. Such a cute idea! 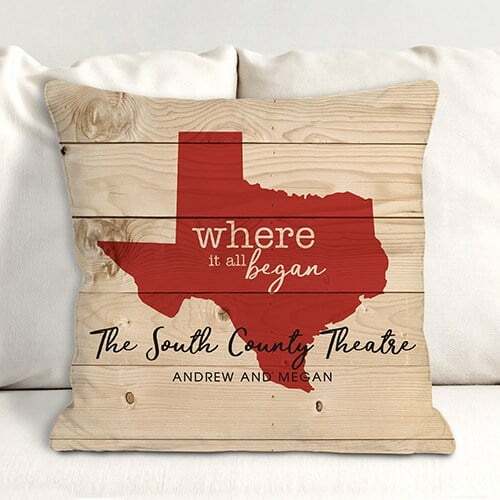 I love the Where It All Began pillow! Such a practical thing and a great reminder!! I think my kids would love to see it and hear the story of where it all began! These are really great ideas. I now have gift ideas for the next several years! I really love the cutting board ! ? I love the cutting board! I love those ideas. The pillow that has the wood grain and the “where it all began” I love. This is such a cute present and would be so fun to have on the couch.